But they are also deep fried, and most people care about the calories (T_T). Recently in Japan, baked and cold doughnuts have been popular as healthier alternatives to regular doughnuts, and long lines have been forming in front of the doughnut shops. Here is a funny story. 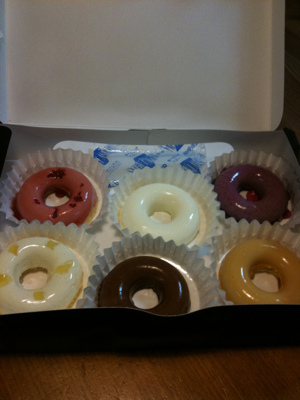 The other day my friend, Yoko, waited in a line and bought some baked doughnuts for her son who is a doughnut lover. But just after he had a bite, his happy smile disappeared, becoming a confused look. He said, “Mom…This is not a doughnut, is it?” He thought that it looked like a doughnut but tasted like a slice of pound cake. Well, I think he is right. The ingredients in doughnuts and pound cake are similar, so if you bake the dough for doughnuts, it becomes just like a “doughnut-shaped pound cake” (^^;). 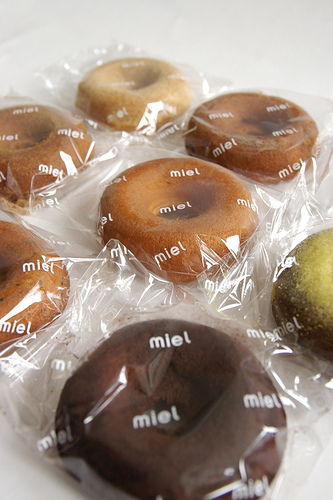 These might be “doughnut-shaped Bavarian creams”? 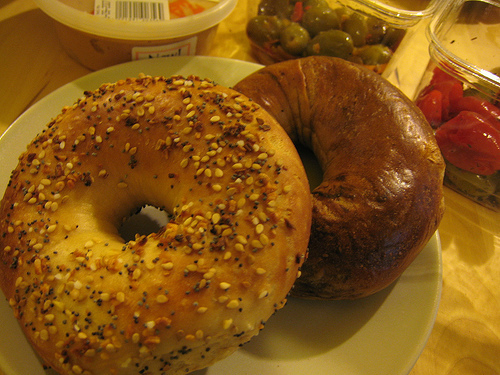 Bagels also look like doughnuts. Could they be called “baked doughnuts”! ?